Lakhmir Singh & Manjit Kaur kaur Solutions for Class 10 Science Chapter 3 Sources Of Energy are provided here with simple step-by-step explanations. These solutions for Sources Of Energy are extremely popular among class 10 students for Science Sources Of Energy Solutions come handy for quickly completing your homework and preparing for exams. All questions and answers from the Lakhmir Singh & Manjit Kaur kaur Book of class 10 Science Chapter 3 are provided here for you for free. You will also love the ad-free experience on Meritnation’s Lakhmir Singh & Manjit Kaur kaur Solutions. All Lakhmir Singh & Manjit Kaur kaur Solutions for class 10 Science are prepared by experts and are 100% accurate. Name a non-renewable source of energy other than fossil fuels. Nuclear fuel, such as uranium, is a non-renewable source of energy other than fossil fuels. Define calorific value of a fuel. The amount of heat produced when a unit mass of a fuel is completely burnt is known as the calorific value of the fuel. "The calorific value of cooking gas (LPG) is 50 kJ/g". What does it mean? When you say that the caloric value of cooking gas (liquefied petroleum gas, or LPG) is 50 kJ/g, it means that when 1 gram of LPG is burnt completely, it produces 50 kilojoules of energy in the form of heat. Which of the following produces more heat (per unit mass) on burning? Liquefied petroleum gas, or LPG, produces more heat than coal, because LPG (50 kJ/g) has higher a calorific value than coal (25-30 kJ/g). (a) What is a fuel? Give five examples of fuels. (b) What are the characteristics of an ideal fuel (or good fuel)? (c) The calorific value and ignition temperature of fuel A are 55 kJ/g and 80°C, respectively. These values for fuel B are 80 kJ/g and 10°C, respectively. On burning, the fuel A produces CO2 and H2O while the fuel B produces CO2 , CO and SO2. Give three points of relative and disadvantages of these two fuels. a) Materials that burn to produce heat energy are known as fuels. Examples of fuels are wood, coal, petrol, diesel and liquefied petroleum gas (LPG). b) The characteristics of a good fuel are the following. 1. It should have a high calorific value, i.e., it should give an adequate amount of heat per unit mass. 2. It should burn without giving out any harmful gases, so that it does not pollute the air. 4. It should be cheap, easily available and easy to handle. 5. After burning, it should not leave much ash. c) Advantages of fuel 'A'. 1.It has a moderate ignition temperature. 2. It does not produce any harmful gases. 1. It has a low calorific value and produces less heat per unit mass. 1. It has a high calorific value and hence generates more heat. 1. It has a very low ignition temperature and hence is unsafe to use. 2. It produces harmful gases, such as CO and SO2. Biogas is a renewable source of energy . Natural gas is a non-renewable source of energy as it takes thousands of years to form. Which of the following is not a renewable source of energy? Fossil fuels are non-renewable sources of energy because they are present in limited amounts on the earth. A good fuel should have a high calorific value so that it can give us more heat per unit mass. It should also have a moderate ignition temperature. Methane has a calorific value of 55 kJ/g. A plant sapling takes more than 15 years to grow and mature into a tree. Which of the following fuels has the highest calorific value? Hydrogen gas has the highest calorific value (150 kJ/g). Wood has the lowest calorific value among the given fuels. Define ignition temperature of a fuel. The ignition temperature of a fuel is the minimum temperature to which a fuel must be heated so that it catches fire and starts burning. "The ignition temperature of a fuel is 80°C". What does this mean? If the ignition temperature of a fuel is 80°C, it means that the fuel must be heated up to 80°C to burn. No fuel can burn unless it is heated to its ignition temperature. The amount of heat produce by burning a unit mass of a fuel completely is known as its ............ value. The amount of heat produced by burning a unit mass of a fuel completely is known as its 'calorific' value. What is a source of energy? What are the two main categories of the sources of energy? A source of energy is that which provides a required amount of energy in a convenient form for a long time. State any four characteristics of a good source of energy. Four characteristics of a good source of energy are as follows. a) It should have a high calorific value. b) It should be cheap and easily available. c) It should be safe to handle and use. d) It should be environment friendly, i.e, it should not cause pollution. What is meant by a non-renewable source of energy? Give two examples of non-renewable source of energy. The sources of energy that have accumulated in nature over a very long time and cannot be quickly replaced when exhausted are called non-renewable sources of energy. What is meant by a renewable source of energy? Give two examples of renewable sources of energy. The sources of energy that are being produced continuously in nature and are inexhaustible are called renewable sources of energy. Examples: Wind, wood, sunlight and biomass. What is the difference between a renewable and a non-renewable source of energy? Explain with examples. 1. Renewable sources of energy are those sources of energy that are being produced continuously in nature. 2.These sources of energy can be used again and again. 3. Examples of renewable sources of energy are wind, sunlight and tides. Non-renewable sources of energy are those sources of energy that have accumulated in nature over a very long time. These sources of energy cannot be used again and again. Examples of non-renewable sources of energy are coal, petroleum and natural gas. Why are fossil fuels classified as non-renewable source of energy? Fossil fuels are classified as non-renewable sources of energy because they are present in limited amounts on the earth. Once they are exhausted, they cannot be replenished, and they will no longer be available to us. Name two sources of energy that you think are renewable. Give reason for your choice. The following are two sources of energy that are renewable. They are renewable because they are abundant in nature and can be used again and again..
Name two sources of energy which you consider to be non-renewable. Give reason for your choice. The following are two non-renewable sources of energy. They are non-renewable because they are present in limited amounts on the earth. Once they are exhausted, they cannot be replenished, and they will no longer be available to us. (b) What is the basis of above classification? (a) Coal, petroleum and natural gas are non-renewable sources of energy, whereas wind, tides and wood are renewable sources of energy. (b) The basis of the above classification is the abundance or depletion of the energy sources mentioned and the amount available for the future. Coal is said to be formed from the wood of trees. Why then is coal considered to be a non-renewable source of energy whereas wood is a renewable source of energy? Coal is classified as a non-renewable source of energy because, when trees die and are buried in the earth, they take many years to decompose and form coal. So, they are not easily available. But wood will continue to be available to us if we use it properly as per a plan. The fuel with the highest calorific value would have less carbon and more hydrogen, because hydrogen has a higher calorific value than carbon. A good fuel should not have a high ignition temperature. Fossils form deep under the earth's surface from the prehistoric remains of living organisms. Biogas is a mixture of methane, carbon dioxide, hydrogen and hydrogen sulphide. It is produced by the anaerobic degradation of animal wastes such as cow dung in the presence of water. The calorific values of three fuels A, B and C are 33 kJ/g, 48 kJ/g and 150 kJ/g, respectively. A is solid, B is liquid and C is a gas at room temperature. One combustion, both A and B produce carbon dioxide while C explodes forming steam. B and C leave no residue after combustion while A leaves behind some solid residue. Which one of the three fuels is the most ideal? Give two reasons to support your answer. Fuel A has a low calorific value compared with the other fuels, and therefore, it cannot be considered the most ideal fuel. Fuel B is the most ideal fuel of the three for the following reasons. (a) It has a high calorific value. (b) It burns completely without leaving any residue. Fuel C has both the characteristics of fuel B but is unsafe as it explodes. Hence, B is the ideal fuel. Calorific value and ignition temperature of fuel X are 75 kJ/g and 20°C respectively. These values for fuel Y are 50 kj/g and 75°C respectively. On burning, the fuel Y produces only CO2 while fuel X produces CO2 and CO. Which of the two is a better fuel? Give two reasons to support your answer. Fuel Y is the better fuel for the following reasons. (a) It has a moderate ignition temperature of 75°C, i.e., neither too high nor too low. (b) It does not produce harmful gases such as carbon monoxide (CO). Which of the fuels could be : (i) cooking gas (ii) alcohol (iii) wood (iv) hydrogen (v) kerosene? (i) Cooking gas is D.
(iv) Hydrogen gas is C.
The fuels in the decreasing order of calorific values are as follows. The fuels in the increasing order of calorific values are as follows. Most of the fuels contain carbon as one of the constituents. Name a fuel which has very high calorific value but not contain carbon. Hydrogen gas has a high calorific value (150 kJ/g) but does not contain carbon. Name the product of petroleum that is used to drive heavy vehicles. Diesel is used to drive heavy vehicles. Give one example of a good domestic fuel. Liquefied petroleum gas (LPG) is used as a domestic fuel. Name any one hydrocarbon fraction obtained during the fractional distillation of petroleum which is used as a domestic fuel. Kerosene is obtained during the fractional distillation of petroleum. What are the various fuels which are used to generate electricity in a thermal power plant? Fossil fuels, such as coal, oil and gas, are burnt to generate electricity in a thermal power plant. Name any four fractions obtained from petroleum which are used as fuels. Four fractions obtained from petroleum that are used as fuels are petrol (gasoline), diesel, kerosene and petroleum gas. (a) What are fossil fuels? Give three examples of fossil fuels. (b) Describe how fossil fuels were formed. (c) Explain how, sun is considered to be the ultimate source of fossil fuels. (d) Which fossil fuels were formed by the buried remains of small plants and animals? (e) Which fossil fuel formed by the buried remains of large land plants? (a) Natural fuels that are found deep inside the earth and are formed from the prehistoric remains of organisms are called fossil fuels. Three examples of fossil fuels are coal, petroleum and natural gas. (b) Plants and animals that died millions of years ago got buried deep inside the earth and covered by mud and sand. In the absence of oxygen and because of the chemical effects of pressure, heat and bacteria, the remains of the plants and animals were, over the years, converted into fossil fuels, such as coal, petroleum and natural gas. The buried remains of large plants got converted into coal and those of small plants and animals into petroleum and natural gas. (c) We know that green plants use sunlight for photosynthesis, which is the process by which they produce food for their growth. When animals eat plants for energy, they consume food made with the help of sunlight. When plants and animals die, their remains, which consist of material directly or indirectly made with the help of sunlight, are buried in the earth and converted into fossil fuels, such as coal and petroleum. Hence, the sun is the ultimate source of fossil fuels. (d) Petroleum and natural gas are formed from the buried remains of small plants and animals. (e) Coal is formed from the buried remains of large plants. Butane is the main constituent of petroleum gas. Natural gas consists mainly of methane. Which of the following is not produced by the burning of fossil fuels? The burning of fossil fuels produces sulphur dioxide, nitrogen dioxide and carbon dioxide. A special grade of kerosene oil is used as aviation fuel in jet aeroplanes. The sun is the ultimate source of energy stored in all fossil fuels. Which of the following is not a fossil source of energy? Fossil fuels take thousands of years to form deep under the earth. Cow dung does not come under this category of fuels. Thermal power plants use only coal, oil or gas as fuel. What is the composition of liquefied petroleum gas (LPG)? Liquefied petroleum gas (LPG) consists mainly of butane along with smaller amounts of propane and ethane. Which gaseous fuel is being used increasingly in transport vehicles like cars and buses these days? Compressed natural gas (CNG) is being increasingly used in transport vehicles. Write the full form of: (i) LPG, and (ii) CNG. The full forms of the abbreviations LPG and CNG are as follows. (i) LPG is liquefied petroleum gas. (ii) CNG is compressed natural gas. The main constituents of these gases are as follows. Name the component which is found in natural gas well as in biogas. Methane is found in natural gas as well as in biogas. State two important uses of natural gas. State one important use of CNG these days. Compressed natural gas (CNG ) is used as a fuel for transport vehicles. Domestic gas cylinders, such as those of Indane, mainly contain 'butane'. Explain why, natural gas is considered to be a good fuel. Natural gas is a good fuel because it has a high calorific value of up to 50 kJ/g. It burns with a smokeless flame and causes no air pollution. There is also no need for additional storage and transport because it can be directly supplied from gas wells to homes. What is meant by conventional sources of energy? Write the names of two conventional sources of energy. The traditional sources of energy that are familiar to most people are called conventional sources of energy. Coal and petroleum are two conventional sources of energy. Explain the principle of working of a thermal power plant. Draw labelled diagram to illustrate your answer. In a thermal power plant, electricity is generated using coal as the fuel. Coal is used to generate steam, which helps rotate turbines connected to a generator. The generator converts mechanical energy into electrical energy. What are the disadvantages of burning fossil fuels? The disadvantages of burning fossil fuels are as follows. (a) The burning of fossil fuels produces gases such as sulphur dioxide and nitrogen oxide, which cause acid rain, damaging trees and land and affecting aquatic life. (b) It produces carbon dioxide, which affects all kinds of organisms. (c) It produces smoke and ashes, which cause air pollution. Write a short note on the pollution caused by burning fossil fuels. The burning of fossil fuels produces gases such as sulphur dioxide and nitrogen oxides that cause acid rain. Acid rain damages trees, land and buildings and affects aquatic life. The burning of fossil fuels produces carbon dioxide, which is responsible for the greenhouse effect on the earth. It also produces smoke and ashes, which pollute the air. What are the various steps which can be taken to control (or reduce) pollution caused by burning fossil fuels? Various steps can be taken to reduce the pollution caused by burning fossil fuels. These are as follows. (a) The air pollution caused by the burning of petroleum fuels in vehicles can be reduced by using catalytic converters in vehicles. Catalytic converters convert harmful gases into harmless gases. (b) The air pollution caused by the burning of coal in thermal power plants can be reduced by washing smoke and acidic gases with water in scrubbers. (c) The air pollution caused by thermal power plants can also be reduced by installing electrostatic precipitators in their chimneys. The unburnt carbon particles and fly ash get deposited in the chimneys before the exhaust gases from the power plants are let into the air. If you could use any source of energy for heating your food, which one would you use and why? Natural gas can be used for heating and cooking food as it is a clean source of energy. It has a high calorific value and does not produce a large amount of smoke on burning. It is easy to use and transport. Why is LPG considered a good fuel? Liquefied petroleum gas (LPG) is considered a good fuel for the following reasons. a) It has a high calorific value (50 kJ/g). b) It burns with a smokeless flame and hence does not pollute the air. c) It is easy to handle and convenient to store. d) It is a clean domestic fuel and does not produce any harmful gas. Why is LPG considered a better fuel than coal? Liquefied petroleum gas (LPG) is considered a better fuel than coal for the following reasons. a) It has a higher calorific value (50 kJ/g) than coal (30 kJ/g). b) It burns with a smokeless flame and hence does not pollute air, whereas coal produces smoke on burning. c) It is easier to handle and more convenient to store than coal. d) It is a clean domestic fuel and does not produce any harmful gas, whereas coal, on burning, produces carbon dioxide, which causes air pollution. Why is the leakage of LPG detected easily although it is odourless? State the steps to be taken in case its leakage is detected in the kitchen. Liquefied petroleum gas (LPG) is odourless, but to detect leakage of the gas, a small quantity of strong-smelling ethyl mercaptan (C2H5SH) is added to it. Ethyl mercaptan has a foul smell resembling that of hydrogen sulphide gas, which can be easily detected. The following steps are to be taken when leakage of LPG is detected in the kitchen. a) Lighted matchsticks and other burning substances should be kept away. b) The knob of the gas stove must be closed. c) The valve of the gas cylinder should be checked and changed immediately if any damage is found. Liquefied petroleum gas (LPG) consists mainly of butane, along with smaller amounts of propane and ethane. Coke is used as a reducing agent in the extraction of metals from their ores. Charcoal cannot be obtained from coal. Only nitrogen oxides, sulphur dioxide and carbon dioxide are responsible for acid rain. Fossil fuels are energy rich compounds of an element X which were originally made by the plants with help of sun's energy. (a) Name the element X. (b) Name another element which is usually found in combination with X in fossil fuels. (a) Element X is carbon. (b) Another element found in combination with carbon in fossil fuels is hydrogen. The energy in petrol originally came from the sun. Explain how it got into petrol. We know that green plants use the energy from sunlight for photosynthesis and growth. They store this energy in the form of carbon compounds. Thus, every leaf and every bit of wood in plants and trees is made using the energy from sunlight. Animals eat plants for energy, which is originally received from sunlight. These plants and animals die and their remains get converted into coal and petrol, respectively, which are energy-rich compounds of carbon that were made by plants using solar energy. A substance X is added to LPG cylinders while filling so as to make the detection of leakage of LPG from the cylinder easy. (a) Name the substance X. (b) How does substance X make the detection of leakage of LPG easy? (a) Substance X is ethyl mercaptan (C2H5SH). (b) Ethyl mercaptan is a pungent substance and hence easy to detect. The pollution of air caused by burning petroleum fuels (like petrol and diesel) in vehicles can be controlled by fitting a device X in the exhaust system of vehicles. (b) How does this device help in controlling air pollution? (a) The device is a 'catalytic converter'. (b) A catalytic converter converts the harmful gases from the exhaust of vehicles into harmless gases. For example, it converts carbon monoxide into carbon dioxide, and nitrogen oxide into nitrogen gas. A hydro-power plant converts one form of energy into another. Name the two forms of energy. A hydropower plant converts potential energy (of stored water) into electrical energy by rotating turbines in flowing water. What type of energy is possessed by flowing water? Flowing water possesses kinetic energy. Flowing water can rotate a turbine. Which type of energy is used up by the turbine? The kinetic energy of flowing water is used to rotate a turbine. Name the original source of wind energy. The sun is the original source of wind energy. What should be the minimum wind speed for the satisfactory working of a wind-powered electric generator? The minimum wind speed for the satisfactory working of a wind-powered electric generator is 15 km/h. Write one use of wind energy (a) in the past (b) at present. (a) In the past, wind energy was used in windmills to pump water from wells and to grind wheat into flour. (b) Nowadays, wind energy is used to generate electricity through wind-powered generators. Why is the copper tube of a solar water heater painted black from outside? The copper tube of a solar water heater is painted black from outside so as to collect as much the sun's heat as possible, because a black surface absorbs more heat than a white surface. What type of reactions occurring inside the sun produce solar energy? The nuclear fusion reaction that occurs inside the sun produces solar energy. Name some of the solar energy devices. Solar cookers, solar water heaters and solar cells are solar energy devices. What type of reflector is used in a box-type solar cooker? A plane mirror is used as the reflector in a box-type solar cooker. What is the range of temperature which can be achieved in a box-type solar cooker in two to three hours? The range of temperature achieved in a box-type solar cooker in two to three hours is 100°C to 140°C. Name the device which converts sunlight into electricity. Solar cells convert sunlight into electricity. How much solar energy will be received by 1 m2 area in one hour if the solar constant be 1.4 kW/m2? A solar cell converts ................ energy into ................ energy. A solar cell converts solar energy into electrical energy. (a) What is the difference between a thermal power plant and a hydro power plant? (b) Which of the two causes serious air pollution and how? 1. A hydropower plant uses flowing water to rotate turbines. A thermal power plant uses coal, oil or gas to drive turbines. 2. A hydropower plant does not cause air pollution. A thermal power plant causes air pollution. (b) A thermal power plant causes serious air pollution. This is because, in a thermal power plant, large amounts of fossil fuels are burnt every day to generate electricity. (a) What is hydroelectricity? Explain the basic principle of generation of hydroelectricity with the help of a labelled diagram. (b) State two advantages of producing hydroelectricity. (c) State two disadvantages of producing hydroelectricity. (a) Hydroelectricity is the product of a process by which mechanical energy from the flow of water is used to generate electricity. It works on the principle of conversion of mechanical energy into electrical energy. Mechanical energy from the flow of water is used to rotate turbines, which are connected to a dynamo that generates electricity. (b) The advantages of hydroelectricity are given below. (1) It does not cause any pollution. (2) It is a renewable form of energy. (c) The disadvantages of hydroelectricity are given below. (1) Hydroelectricity plants require the construction of large dams, which affects the ecology of the surroundings. (2) Hydropower plants require water in reservoirs and are dependent on rain for their functioning. (a) With the help of a labelled diagram, explain the construction and working of a solar cooker. (b) Why is the solar cooker box painted black from inside? (c) Why is the solar cooker box covered with a glass sheet? (a) A solar cooker is illustrated below. A mirror, black box and glass lid are required to construct a solar cooker.. The mirror is mounted on the box to concentrate light rays onto the cooker box. The box is painted back from the inside to absorb the maximum light. It is covered with a glass lid to produce a greenhouse effect inside it. See the diagram given above. A solar cooker is a device in which heat energy from sunlight is trapped inside the cooker using the phenomenon of the greenhouse effect. A solar heating device such as a solar cooker uses a reflector to reflect sunlight to a small area where the cooking container is placed. The light from the sun is focussed on the container, which gets heated, cooking the food. (b) A solar cooker box is painted back from the inside so that light is not reflected and the maximum absorption takes place. (c) A solar cooker is covered with a glass sheet to produce a greenhouse effect inside the cooker box. The greenhouse effect is a phenomenon by which heat is trapped. (a) What is wind? What type of energy is possessed by wind? (b) Explain how, wind energy can be used to generate electricity. Illustrate your answer with the help of a labelled diagram. (c) State two advantages of using wind energy for generating electricity. (d) Mention two limitations of wind energy for generating electricity. (a) Wind is the flow of air and is a source of energy. It possesses mechanical energy. (b) Wind is the flow of air and possesses mechanical energy. 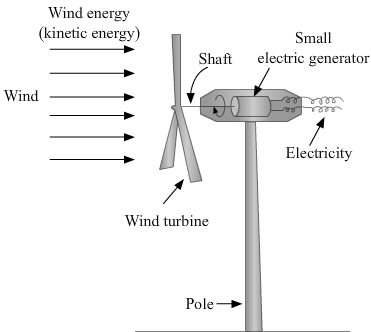 This mechanical energy is used to rotate wind turbines, which are connected to electricity generators. See the diagram given below. (c) The advantages of wind energy are as follows. (1) Wind is a clean source of energy. It does not cause any pollution. (2) It is a renewable source of energy. (d) The limitations of wind energy are as follows. (1) The production of energy depends on the flow of air. It varies during different times of the day and is seasonal. (2) The initial capital cost is very high. A solar water heater receives energy from the sun, but the sun does not appear on a cloudy day. Therefore, a solar water heater does not receive energy on a cloudy day and cannot heat up water. (c) water is converted into steam to turn turbines and produce electricity. (d) potential energy possessed by stored water is converted into electricity. A hydropower plant uses running water to rotate turbines. The part of a box-type solar cooker that is responsible for producing a greenhouse effect is its glass-sheet cover. Solar cells are made of semiconductors. The value of the solar constant is 1.4kW/m2. Infrared rays make sunlight warm. The warmth of sunlight is used in a solar cooker. A transparent glass sheet does not allow the incident sun's heat to be reflected back. Compare the sun and the fossil fuels as the sources of energy. 1. Fossils fuels are formed from the remains of dead plants and animals. 2. The burning of fossil fuels causes air pollution. 3. Fossils fuel are non-renewable sources of energy. Inside the sun, nuclear fission occurs, which produces enormous amounts of heat. The use of solar energy does not cause any air pollution. Sunlight is a renewable source of energy. What kind of mirror, concave, convex or plane, would be best suited for use in a solar cooker? Why? A concave mirror is best suited for use in a solar cooker because it converges a large amount of the sun's heat rays at its focus, because of which a high temperature is produced in the focus area. (a) Name that part of a box-type solar cooler which allow the sun's heat rays to enter the box but does not allow inside heat to go out. (b) Explain why, a plane mirror reflector is used in a box-type solar cooker. 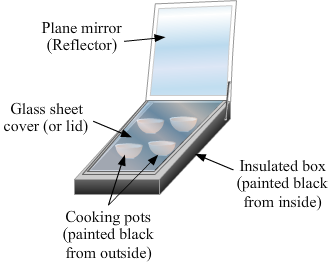 (a) A glass-sheet cover in a box-type solar cooker allows the sun's heat to enter the box but does not allow the heat inside to go out. (b) A plane mirror reflects the sun's rays in the form of a strong beam of light. This property of a plane mirror is used in a box-type solar cooker. What are the advantages and disadvantages of using a solar cooker? The advantages of using a solar cooker are as follows. a) It does not require fuels such as coal, kerosene and liquefied petroleum gas (LPG). b) It does not produce harmful smoke that pollutes the air. c) It does not spoil the nutrients in food. d) It allows for the preparation of more than one item at a time. The disadvantages of using a solar cooker are as follows. a) It cannot be used to cook food at night. b) A cloudy sky affects its working. c) The direction of the reflector has to be changed from time to time. d) It cannot be used for baking. (a) What is a solar cell? Draw the labelled diagram of a solar cell. (b) Name the semi-conductor material which is usually used for making solar cells. (c) Write the uses of solar cells. (a) A solar cell is an electrical device that converts light energy into electrical energy. (b) A semiconductor material, such as silicon, is used in making solar cells. (c) The uses of solar cells are given below. State the advantages and disadvantages of using solar cells. The advantages of solar cells are that they do not have moving parts, they require no maintenance and they work with any kind of light-focussing devices. Moreover, they can be used even in remote areas. The disadvantages of solar cells are that they require an expensive special grade of silicon or silver wire, they have low efficiency and they convert only 25 per cent of light falling on them into electricity. What is a solar cell panel? For what purpose is it used? State its two main advantages. A solar cell panel consists of a large number solar cells joined together in a series in a definite pattern. Solar cell panels are used to provide electricity in remote and inaccessible rural areas. The advantages of solar cell panels are given below. (a) They provide a larger amount of electricity than a single cell and hence can be used to operate TVs and water pumps. (b) The electricity produced by solar cell panels can be stored in batteries and used at night. (a) What is solar constant? What is the value of solar constant? (b) If the energy received by 5 m2 area in 10 minutes is 4200 kJ, calculate the value of solar constant. (a) The amount of solar energy received per second on one square metre area of the near-earth space at an average distance between the sun and the earth is called the solar constant. Its value is 1.4 kJ/s/m2 or 1.4 kW/m2. How has the traditional use of energy of flowing water been modified for our convenience? Before the beginning of the Industrial Revolution, water energy served many purposes, but the methods of using it were not efficient. For example, the flow of water was used for transporting wooden logs and grinding wheat to make flour. Nowadays, water energy is harnessed to produce electricity, which is a better and more efficient use of this form of energy. How has the traditional use of energy of wind energy been modified for our convenience? Before the beginning of the Industrial Revolution, wind energy served many purposes, but the methods of using it were not efficient. For example, windmills were used to power smaller mills, such as flour mills and saw mills. Nowadays, wind energy is harnessed to produce electricity, which is a better and more efficient use of this form of energy. The minimum speed of wind should be 15km/h for the satisfactory working of a wind generator. The glass sheet prevents the sunlight incident on it from being reflected back. A large coal-fired power station produces 2000 MW of electrical energy. A wind turbine with 33 m blades can produce 300 kW. (a) How many turbines would be needed to replace the power station? (b) Why, in actual practice, this number of turbines could not replace the coal-fired power station? Hence, 6667 turbines will be needed. (b) In the thermal power plant mentioned, coal is burnt to produce electricity. Therefore, the quantum of electrical energy produced is fixed. A windmill produces electrical energy depending on the speed of wind, which may vary from time to time. Therefore, wind turbines cannot replace the coal-fired thermal power plant. In a solar water heater, why is the storage tank placed at a higher lever than the solar panel containing coils? In a solar water heater, the storage tank is placed at a higher level than the solar panel containing coils because hot water is lighter and rises up. In many applications, solar cells are connected to rechargeable batteries. Why is this so? Solar cells are connected to rechargeable batteries to store the electricity that we obtain with the help of these cells. The stored electricity can be used later; for example, it can be used at night, when there is no sunlight. (a) Solar cells are used to provide the electric current to charge the batteries of a car driven by an electric motor. Describe the energy changes which take place. (b) What differences would you expect in the charging of car batteries (i) in bright sunlight (ii) on a cloudy day (iii) at night? (a) The solar cells convert the energy from sunlight into electrical energy. This electrical energy is converted into chemical energy when the car batteries are charged. When these charged batteries are used, the chemical energy is converted into electrical energy. In the last stage, this electrical energy is converted into kinetic energy for the car by the electric motor that drives the car. (b) (i) In bright sunlight, the car batteries are charged quickly. (ii) On a cloudy day, the car batteries are charged very slowly. (iii) At night, the car batteries cannot be charged as there is no sunlight. What substance is obtained as a residue when wood is burned in a limited supply of air? When wood is burnt in a limited supply of air, a black substance called charcoal is obtained as a residue. Name one source of energy which is not derived from solar energy directly of indirectly. Geothermal energy is not derived from solar energy directly or indirectly. It is the heat energy obtained from the hot rocks present inside the earth. What name is given to the heat energy obtained from hot rocks inside the earth? Geothermal energy is the heat energy obtained from the fission of radioactive materials present in the hot rocks inside the earth. Name the agent which decomposes animal dung into biogas. A micro-organism called 'anaerobic bacteria' decomposes animal dung into biogas. Oxygen is not required for this decomposition. Which component of biogas is used as a fuel? Methane is the major constituent of biogas that is used as a fuel. Name the constituents of biogas. The constituents of biogas are the following. Which of the following is needed for the formation of biogas from cow-dung and which not? Water is needed and oxygen is not. Biogas is formed by the anaerobic degradation of cow dung in the presence of water but in the absence of oxygen. Name the clean fuel which can be obtained from cow-dung. On the decomposition of the organic matter in cow dung, a clean fuel, 'biogas', is obtained. Apart from cattle dung, what other substances can be added to a biogas plant? Apart from cattle dung, plant wastes can be used as a raw material in a biogas plant. Name any three forms of energy which could be harnessed from the sea. The following are the three forms of energy that can be harnessed from the sea. Write two forms in which solar energy manifests itself in sea. The two forms of energy in which solar energy manifests itself in the sea are sea wave energy and ocean thermal energy. Write the full from of OTE. The full form of OTE is 'ocean thermal energy'. What is the function of anaerobic micro-organisms such as anaerobic bacteria in a biogas plant? In a biogas plant, the function of anaerobic micro-organisms such as anaerobic bacteria is the degradation of animal wastes in the presence of water. Tidal energy is one of the forms in which solar energy manifests itself in oceans. Tidal energy is not one of the forms of energy in which solar energy manifests itself in oceans. (a) Biomass is another form in which ........... energy manifests itself. (b) Tidal waves build up and recede ........... a day. (a) Biomass is another form in which solar energy manifests itself. (b) Tidal waves build up and recede twice a day. (a) What is biomass? Give three examples of biomass. (b) Name the biomass which is still widely used as a source of heat energy in many household of our country. Biomass is organic matter that is used as a fuel to produce energy. Examples: Wood, agricultural wastes and cow dung. (b) Wood is one of the biomass resources that is still widely used as a source of heat energy in many households in our country. What are the two ways in which cow-dung can be used as a fuel? Which of them is better and why? The two ways in which cow dung can be used as a fuel are given below. 1. Cow-dung cakes can be used as a fuel for cooking food. 2. Biogas can be made from cow dung for use as a smokeless fuel. Biogas is a better fuel as it does not cause air pollution. After extracting biogas, the cow dung can still be used as a manure because it continues to retain all the nutrients that plants need. (a) What is biogas? Name the major component of biogas. (b) What are the raw materials used for making biogas? (c) Describe the construction and working of a biogas plant with the help of a labelled diagram. (d) Write any two uses of biogas. (e) Write any two advantages of using biogas. (a) Biogas is a mixture of methane, carbon dioxide, hydrogen and hydrogen sulphide. The major component of biogas is methane. Up to 75 per cent of biogas consists of methane gas. (b) Biogas is produced by using raw materials such as animal wastes and plant wastes in the presence of water. A biogas has an underground tank shaped like a well. It is called a digester and is made of bricks and cement. The dome of the digester acts as a storage facility for biogas. On the top of the dome, there is a gas outlet 'S' with a valve 'V'. A sloping inlet chamber 'I' is situated on the left side, and on the right side, there is a rectangular outlet chamber 'O'. The function of the inlet chamber is to introduce fresh dung slurry into the digester tank and that of the outlet chamber is to facilitate the removal of the spent slurry after the extraction of biogas. A slurry is made in the mixing tank by mixing cow dung and water and then fed into the digester tank through 'I'. The digester is filled up to the cylindrical level, the dome being left free for the collection of biogas. In 50-60 days, the cow dung undergoes degradation by anaerobic bacteria in the presence of water but in the absence of oxygen, with the gradual evolution of gas. The biogas that is formed gets collected in the dome and exerts pressure on the slurry in the tank for its removal through the outlet chamber. (d) Two uses of biogas are given below. (e) Two advantages of using biogas are the following. 1. Biogas is a clean fuel with a high calorific value, so it is a viable alternative to fossil fuels. 2. Large-scale utilisation of biowastes and sewage for producing biogas is a safe and efficient method of waste disposal and a source of energy. (a) What is geothermal energy? (b) What is the source of heat contained in geothermal energy? (c) Explain how, geothermal energy is used to generate electricity. (d) State two advantages of geothermal energy. (e) State two disadvantages of geothermal energy. (b) The hot rocks present below the surface of the earth are the sources of the heat provided by geothermal energy. (c) The hot rocks inside the earth heat the underground water and turn it into steam. As more and more steam is formed between the rocks, it gets compressed to high pressures. A hole is drilled into the earth up to the hot rocks and a pipe is put into it. 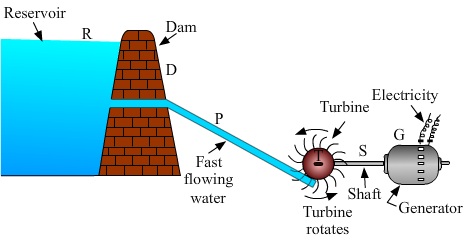 The steam present around the rocks comes up through the pipe at high pressure, which turns the turbine of a generator and thus produces electricity. (d) Two advantages of geothermal energy are given below. 1. It is economical to use. 2. It does not cause any pollution. (e) Two disadvantages of geothermal energy are given below. 1. It is available only in areas where there are hot rocks near the surface of the earth. 2. Deep drilling into the earth to obtain geothermal energy is technically very difficult and expensive. Which of the following is not an example of a biomass energy source? Atomic energy is considered to be coming from atoms. Most of the sources of energy that we sue represent stored solar energy. Which of the following is not ultimately derived from the sun's energy? Geothermal energy is the heat energy from the hot rocks present inside the earth and does not come directly or indirectly from the sun's energy. Up to 75 per cent of biogas consists of methane gas, which makes it an excellent fuel. The major component of biogas is methane gas. Up to 75 per cent of biogas consists of methane. Which of the following is more environment friendly?? Charcoal does not produce smoke while burning, so it is more environment friendly than the other fuels mentioned. Which one of the following is not renewable energy technology? Nuclear power is a non-renewable form of energy, because nuclear materials are limited and hence we will run out of them one day. High tide is the rise of sea water due to the gravitational pull of the moon. Oxygen is not required for the production of biogas. Coke cannot be obtained from biomass. Natural gas is a non-renewable source of energy. The others are renewable sources. Geothermal energy is obtained by the fission of radioactive materials that are naturally present in the hot rocks inside the earth. How is charcoal prepared? Explain why, charcoal is a better fuel than wood. When wood is burnt in a limited supply of air, water and other volatile materials present in it are removed, and a black substance called charcoal is left behind. Charcoal is a better fuel than wood for the following reasons. 1. Charcoal produces more heat on burning than an equal mass of wood. 2. Charcoal does not produce smoke while burning, whereas wood produces much smoke and causes air pollution. 3. Charcoal is a compact fuel that is easy to handle. Compare and contrast biomass and hydroelectricity as sources of energy. 1. Biomass energy is generated from organic matter including wood, agricultural waste and cow dung. Hydroelectricity is produced from the potential energy of water stored at a height. 2. Biomass energy can only be used for heating and cooking. Hydroelectricity can be used for running all types of electrical appliances. 3. No special device is required to produce energy from biomass. Hydroelectricity can be produced by establishing a hydroelectricity plant. Why is biogas considered an ideal fuel for domestic use? 1. It does not cause air pollution as it burns without smoke. 2. It produces a large amount of heat per unit mass. 3. It is a clean fuel as it burns completely without leaving behind any residue. 4. It is cheaper than most common fuels. (a) Explain how tidal energy can used to generate electricity? (b) Why is tidal energy not likely to be a potential source of energy? (a) The power of the rise and fall of the sea level (high tide and low tide) can be harnessed to generate electricity. During high tide, when the level of water in the sea is high, sea water flows from the sea into a reservoir at a dam and turns turbines. The turbines then turn generators to produce electricity. During low tide, when the level of sea water is low, the sea water stored in the dam reservoir is allowed to flow out into the sea. This also turns the turbines and produces electricity. (b) Tidal energy is not likely to be a potential source of energy for the following reasons. 1. The rise and fall of sea water during high and low tides are not enough to generate electricity on a large scale. 2. Very few sites are suitable for building tidal dams. State two ways in which the energy of sea-waves can be harnessed. Two ways in which the energy of sea waves can be harnessed are the following. 1 By setting up floating generators in the sea, which would move up and down with the sea waves. This movement would drive the generators to produce electricity. 2. By letting the sea waves move up and down inside large tubes. As the waves move up, the air in the tubes is compressed. This compressed air can be used to turn the turbines of a generator to produce electricity. What is meant by ocean thermal energy? Explain how ocean thermal energy can be used to generate electricity. The energy that is generated using the difference between the temperatures of water at the surface of the ocean and at deeper levels is called ocean thermal energy. To generate electricity, we use ocean thermal energy conversion (OTEC) power plants for which a temperature difference of 20 degrees Celsius between the surface water and the water at deeper levels is needed. In this process, the warm surface water of the ocean is used to boil a liquid such as ammonia or chlorofluorocarbon. The high-pressure vapours obtained are used to turn the turbine of a generator to produce electricity. What are the limitations of energy that can be harnessed from the sea? The limitations of the energy that can be harnessed from the sea are as follows. 1. Very strong waves are required to obtain electricity from wave energy. Such strong waves are not available in the sea all the time. 2. Tidal energy depends on the relative positions of the earth, the moon and the sun. 3. To harness ocean thermal energy efficiently, the difference between the temperatures of the surface water (hot) and the water at a depth (cold) must be 20ºC or more. 4. Very few sites are suitable for building tidal dams. Suggest a safe and efficient method for the disposal of biowastes and sewage materials. How is this method advantageous to us? Biowastes and sewage can be disposed of by using them in large gas plants to produce biogas and manure. This method is advantageous to us for the following reasons. 1. It is a safe method for large-scale utilisation of biowaste. 2. The biogas produced can be used as a fuel. 3. Good quality manure can be obtained by this method. Which of the following sources of energy are not derived from the sun? The forms of energy that are not derived from the sun are geothermal energy, nuclear energy, hydroelectricity and energy obtained from coal and petroleum. Geothermal energy is the heat energy obtained from the fission of radioactive materials present in the hot rocks inside the earth. Nuclear energy comes from the nucleus of an atom. Hydroelectricity is obtained from the flow of water. The harnessing of which of the following leads to the destruction of large eco-systems? Hydropower projects have many adverse affects on the surroundings and the environment. Which of the following is not a consequence of establishing hydroelectric power plants? All the other given problems can be the consequences of establishing hydroelectric power plants. A certain form of energy is available due to the difference in the temperature of water at the surface of the ocean and its deeper levels. (a) Name the form of energy. (b) Is this energy ultimately derived from the sun or not? (c) Explain how this form of energy can be converted into electricity. (d) What is the minimum temperature difference in water at the surface of ocean and its deeper level which is required to operate power plants based on is energy? (b) Yes. The water at the surface of an ocean gets heated by the heat of the sun and attains a higher temperature than the colder water at deeper levels. So, ocean thermal energy is derived from the sun. (c) In ocean thermal energy conversion plants, the warm surface water of the ocean is used to boil a volatile liquid such as ammonia or a chlorofluorocarbon. This produces high-pressure vapour, which is used to turn the turbine of a generator and produce electricity. The gravitational pull of the moon cause the sea-water to rise periodically. (a) What name is given to the condition of the sea when water to rise periodically. (b) What name is given to the condition of the sea when its raised water recedes? (c) What name is given to the energy which can be harnessed from this natural phenomenon? (a) The name 'high tide' is given to the condition of the sea when its water is raised. (b) The name 'low tide' is given to the condition of the sea when its raised water recedes. (c) The name of the form of energy that can be harnessed by this process is 'tidal energy'. Coal is mined from the earth. B: Coke. It consists mainly of carbon. C: Wood. It is obtained from trees. D: Charcoal. It consists mainly of carbon. A certain form of energy which is not sourced directly or indirectly from the sun and does not cause any pollution is very easily converted into electricity. This form of energy is, however, not available everywhere. Moreover, it is technically very difficult and expensive to obtain it. Name the form of energy. It is geothermal energy, which is not derived directly or indirectly from the sun and does not cause any pollution. It can be converted into electricity. Also, geothermal energy is not available everywhere and is very difficult and expensive to obtain. (a) in a nuclear reactor? (a) The nuclear fission of the heavy nucleus of a radioactive atom is responsible for the liberation of energy. (b) The nuclear fusion of hydrogen nuclei into helium nuclei produces energy in the sun. Which produced of the nuclear fission of uranium-235 is utilised to cause further fission of its nuclei? The neutrons produced in the nuclear fission cause further fission of the heavy nuclei, leading to a self-sustaining chain reaction. Which particles bring about the fission of uranium-235? The low-energy neutrons bring about the fission of uranium-235. State whether the fission of uranium-235 is caused by low energy neutrons or high energy neutrons. The fission of uranium-235 is caused by low-energy neutrons, which are also called slow-moving neutrons. (a) Nuclear fusion is involved in the working of a hydrogen bomb. (b) Nuclear fission is involved in the working of an atom bomb. Name the moderator used in a nuclear reactor. Graphite acts as a moderator by slowing down fast-moving neutrons in a nuclear reactor. Of what material are the control rods of a nuclear reactor made? The control rods of a nuclear reactor are made of chemical elements that are capable of absorbing many neutrons without fissioning themselves, such as boron, silver, indium and cadmium. What do you think is the purpose of the thick, concrete chamber surrounding the reactor of a nuclear power plant? The purpose of the thick, concrete chamber surrounding the reactor of a nuclear power plant is to absorb the dangerous nuclear radiation so as to protect the outside world. (a) What is a nuclear reactor? What is the fuel used in a nuclear reactor? (b) With the help of a labelled diagram, describe the working of a nuclear power plant. (c) How is the working nuclear reactor of a power plant shut down in an emergency? (d) Name five places in India where nuclear power plants are located. (a) A nuclear reactor is a device to harness nuclear energy (fission energy) in a controlled and economical way. The energy produced is used to generate electricity and to power ships. Uranium is used as a fuel in a nuclear reactor. In a nuclear power plant, the fission of U-235 is carried out in a steel vessel (V) of the reactor. Enriched uranium rods (A) are inserted in a graphite core. Here, graphite acts as a moderator that slows down the speed of neutrons. Boron rods (B) are inserted between the uranium rods. These boron rods control the fission reaction. 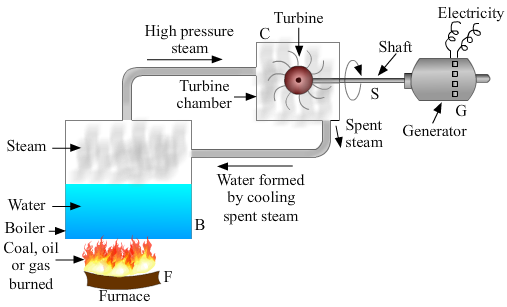 The controlled fission of U-235 produces a large amount of heat energy. 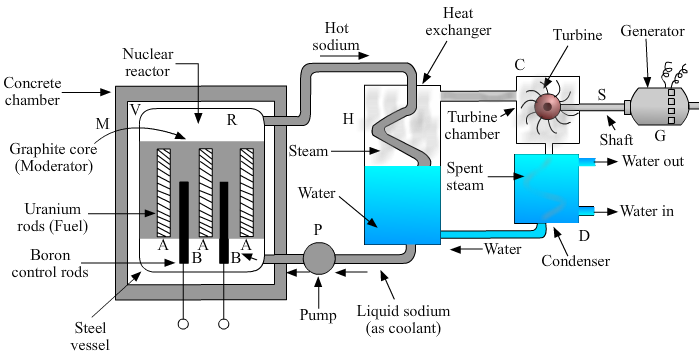 Liquid sodium is pumped continuously through the pipes embedded in the reactor, and it absorbs the heat produced in the reactor. The extremely hot sodium is then passed into the coil of a heat exchanger (H) containing water. The water absorbs the heat from the sodium and boils to form steam. 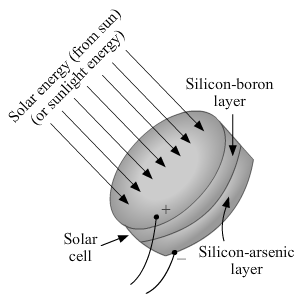 The steam thus formed at high pressure is introduced into a turbine chamber (C) with a turbine (T). The turbine rotates because of the pressure of the steam and drives the generator to produce electricity. (c) In case of an emergency, the control rods are fully inserted in the reactor. They absorb all the neutrons, shutting down the reactor. (d) Five places in India where nuclear power plants are located are the following. Where, in a nuclear power station, is uranium used up? In a nuclear power station, uranium is used as a fuel to produce heat. State one use of nuclear fission reactions. The energy produced during nuclear fission reactions is used for generating electricity . Name the unit which is commonly used for expressing the energy released in nuclear reactions. The energy released in nuclear reactions is expressed in the unit of 'electron volt' (eV) or 'million electron volt' (MeV). The electron volt is a small unit, so the energy released in nuclear reactions is usually expressed in terms of million electron volts. How many MeV are equivalent to 1 atomic mass unit (u)? One atomic mass unit (u) is equivalent to 931 MeV of energy. (c) Nuclear .......... is used in nuclear power stations for the production of electricity. (a) Splitting of a heavy nucleus into two lighter nuclei is called nuclear fission. (b) Uranium-235 atoms will split when hit by neutrons. This is called nuclear fission. (c) Nuclear fission is used in nuclear power stations for the production of electricity. (d) In a nuclear power station, nuclear fission takes place in the reactor. What is nuclear fission? Explain with an example. Write the equation of the nuclear reaction involved. Nuclear fission is the process by which the heavy nucleus of a radioactive atom splits up into smaller nuclei when bombarded with low-energy neutrons. When uranium-235 atoms are bombarded with slow-moving neutrons, the heavy uranium nucleus breaks up to produce two medium-weight atoms, barium-139 and krypton-94, with the emission of three neutrons. A tremendous amount of energy is produced in this process. (a) What is nuclear fusion? Explain with an example. Write the equation of the reaction involved. (b) Why are very high temperatures required for fusion to occur? Nuclear fusion is the process by which two nuclei of light elements combine to form a heavy nucleus. When deuterium atoms are heated to an extremely high temperature under extremely high pressure, two deuterium nuclei combine to form a heavy nucleus of helium, and a neutron is emitted. A tremendous amount of energy is liberated in this fusion reaction. (b) When two positively charged nuclei are brought together, they repel each other. Therefore, a very high temperature is required to force the lighter nuclei to fuse together to form a bigger nucleus. What is the nuclear fuel in the sun? Describe the process by which energy is released in the sun. Write the equation of the nuclear reaction involved. Hydrogen atoms can be considered a nuclear fuel in the sun because the sun derives its energy from the fusion of hydrogen nuclei. The main nuclear fusion reaction taking place in the sun, a reaction that releases a tremendous amount of energy, is the fusion of four hydrogen atom nuclei to form the bigger nucleus of the helium atom. The total energy produced by the fusion of hydrogen into helium is tremendous. All this energy is released in the form of heat and light. (a) Write Einstein's mass-energy equation. Give the meaning of each symbol which occurs in it. (b) If 25 atomic mass units (u) of a radioactive material are destroyed in a nuclear reaction, how much energy is released in MeV? E is the amount of energy produced if mass, m, is destroyed and c is the speed of light. (a) What is the source of energy of the sun and other stars? (b) Describe the working of a hydrogen bomb. (c) What is common between the sun and a hydrogen bomb? (a) The sun and other stars obtain their energy from the nuclear fusion reactions of hydrogen. So, hydrogen can be considered a source of energy. (b) We know that a hydrogen bomb consists of deuterium, tritium and lithium. A hydrogen bomb is exploded by using an atom bomb. When an atom bomb is exploded, much heat is produced, which raises the temperature of deuterium and tritium to an extent in a small time. At this temperature, fusion reactions of deuterium and tritium take place, producing a tremendous amount of energy. This process causes the explosion of a hydrogen bomb, releasing an enormous amount of energy in a very short time. (c) In the sun as well as in a hydrogen bomb, energy is produced by nuclear fusion reactions of hydrogen. (a) What will happen if slow moving neutrons are made to strike the atoms of a heavy element U92235? What is the name of this process? (b) Write a nuclear equation to represent the process which takes place. (c) Name one installation where such a process is utilised. (a) When the atoms of a heavy element, U-235, are bombarded with slow-moving neutrons, the uranium nucleus breaks up to produce two medium-weight atoms, barium-139 and krypton-94, with the emission of three neutrons. A tremendous amount of energy is produced in this process. The name of this process is nuclear fission. (b) The nuclear reaction is as follows. (c) The process is used in nuclear power stations. (a) What are the advantages of nuclear energy? (b) State the disadvantages of nuclear energy? (a) The advantages of nuclear energy are given below. 1. In the production of nuclear energy, gases such as carbon dioxide and sulphur dioxide are not produced. So, it does not contribute to the greenhouse effect or acid rain. 2. There is no need for putting in nuclear fuel again and again, because once the fuel is loaded into the reactor, the nuclear power plant can go on producing electricity for two to three years at a stretch. (b) The disadvantages of nuclear energy are given below. 1. The waste products are radioactive, and they keep on emitting harmful radiations. 2. The availability of fuel is limited. 3. There is the risk of accidents in nuclear reactors, which may lead to the leakage of radioactive materials, causing serious damage to all living things. The following questions are about the nuclear reactor of a power plant. (a) Which isotope of uranium produces the energy in the fuel rods? (b) Will the fuel rods last for ever? (c) Is the energy produced by nuclear fission or nuclear fusion? (d) What is the purpose of using the graphite moderator? (e) What is the function of boron rods in the nuclear reactor? (f) Why is liquid sodium (or carbon dioxide gas) pumped through the reactor? (a) Uranium-235 produces the energy in the fuel rods. (b) No. But a nuclear power plant can work day and night for two to three years on the same uranium fuel. (c) Its energy is produced by nuclear fission. (d) Graphite acts a moderator in the reactor by slowing down fast-moving neutrons in it. (e) The boron rods act as control rods and absorb excess neutrons, preventing the fission reaction from going out of control. (f) Liquid sodium is pumped to transfer the heat produced in the reactor by fission to a heat exchanger for converting water into steam. (a) Graphite is used as a moderator. (b) The reactor is enclosed in a concrete chamber to absorb the nuclear radiation. (c) Uranium-235 is used in the fuel rods. (d) Boron rods are used as the control rods. (e) Liquid sodium is used to carry away the heat. (a) how do control rods control the rate of fission? (b) how is heat removed from the reactor core, and what use is made of this heat? (a) Control rods control the rate of fission by absorbing excess neutrons. (b) Liquid sodium is used to remove the heat from the reactor core. It is used as a coolant, and it transfers the heat to the heat exchanger. This heat is used to convert water into steam. How does inserting the control rods in the graphite core affect the fission in the reactor? Explain your answer. When the control rods are inserted in the graphite core, they absorb excess neutrons and thus prevent the fission reaction from going out of control. What are the advantages and disadvantages of using nuclear fuel for generating electricity? 1. Nuclear power stations need less fuel than power stations that burn fossil fuels to produce the same amount of electricity. 2. There is no emission of greenhouse gases. 3. Nuclear fuel does not produce sulphur dioxide, a gas that affects health and produces acid rain. 1. The initial cost of designing and building a nuclear power station is high. 2. Thermal pollution occurs because of the discharge of hot water from nuclear power stations. 3. There is the risk of accidents in a nuclear reaction. (a) Differentiate between nuclear fission and nuclear fusion. (i) for the production of electricity? (ii) for making a hydrogen bomb? (c) Which produces more energy : nuclear fusion or nuclear fission? (d) Calculate the energy released in joules when 5 g of a material is completely converted into energy doing a nuclear reaction. ↵(a) Nuclear fission and nuclear fusion can be differentiated as follows. Definition Fission is the splitting of the heavy nucleus of a radioactive atom into smaller nuclei. Fusion is the fusing of two or more lighter nuclei into a heavy nucleus. Natural occurrence of the process The process of nuclear fission does not normally occur in nature. Fusion occurs in stars, such as the sun. Energy released The energy released by fission is a million times greater than that released in chemical reactions, but is lower than the energy released by nuclear fusion. The energy released by fusion is three to four times greater than the energy released by fission. (i) Nuclear fission can be used for the production of electricity. (ii) The process of nuclear fusion is used for making hydrogen bombs. (c) Nuclear fusion. The energy released by fusion is three to four times greater than the energy released by fission. Which of the following is used as a moderator in the reactor of a nuclear power station? Graphite acts a moderator in the reactor by slowing down fast-moving neutrons in it. Boron is used in the control rods as it absorbs neutrons. Liquid sodium and carbon dioxide are used in order to transfer the heat produced in the reactor by fission to the heat exchanger, for converting water into steam. (d) which cools the generator coils to prevent their overheating. Liquid sodium or carbon dioxide gas is used as a coolant. Which of the following is ultimately not derived from the sun's energy (or solar energy)? Nuclear energy comes from the nucleus of an atom. One atomic mass unit is equal to 931 MeV. In a nuclear reactor, the controlled fission of uranium-235 produces a large amount of heat energy. It is the amount of energy acquired by an electron having a charge of 1.6 × 10−19 C when accelerated through a potential difference of 1 volt. Which of the following can be produced during the nuclear fission as well as nuclear fusion reactions? In both reactions, neutrons can be produced. Nuclear fusion reactions are the source of the sun's energy. The sun's energy is derived from the fusion of hydrogen nuclei into helium nuclei. In an atom bomb, the fission reaction of uranium-235 or plutonium-239 is deliberately allowed to go out of control so as to produce an enormous amount of energy in a very short time. One MeV of nuclear energy is equal to 1.6 × 10-13 J. The energy produced in a nuclear fusion reaction is much more than that produced in a nuclear fission reaction and has not been controlled so far. The waste materials produced by the fission of uranium-235 in a nuclear power plant are radioactive and hence extremely harmful to all living things. In both the reactions, heat energy is released owing to the conversion of mass into energy. Which of the following can undergo nuclear fusion reaction? In nuclear fusion, two nuclei of light elements such as that of hydrogen are combined to form a heavy nucleus. Deuterium atoms are the hydrogen atoms of mass number 2. (b) Identify the particle c and the number x of such particles produced in the reaction. (c) What does E represent? (d) Name one installation where the above nuclear reaction is utilised. (e) What type of bomb is based on similar type of reaction? (a) The process represents nuclear fission. In this process, a heavy nucleus of uranium splits into two smaller nuclei of barium and krypton when bombarded with low-energy neutrons. A tremendous amount of energy is also produced. (b) Particle c is a neutron and x is equal to 3. (c) E represents the tremendous amount of energy that is liberated in the reaction. (d) The given reaction is utilised in nuclear power stations. (e) An atom bomb is based on a similar type of reaction. (a) Name the process represented by this equation and describe what happens during this reaction. (d) State two conditions under which such a reaction takes place. (e) What type of nuclear bomb is based on similar reactions? (a) The process represents nuclear fusion. In this process, when two smaller nuclei of deuterium are heated to an extremely high temperature under extremely high pressure, a heavy nucleus of helium and a neutron are emitted. A tremendous amount of energy is also liberated. (b) Particle c is a neutron and x is equal to 1. (c) E represents the tremendous amount of energy liberated. (d) The two conditions are given below. (e) A hydrogen bomb is based on similar reactions. The mass numbers of four elements A, B, C and D are 2, 20, 135 and 235, respectively. Which one of them will be most suitable to make: (i) an atom bomb, and (ii) a hydrogen bomb? (i) An atom bomb is based on nuclear fission reactions. So, a heavy nucleus D of mass number 235 is the most suitable to make it. (ii) A hydrogen bomb is based on nuclear fusion reactions. So, a light element A of mass number 2 is the most suitable to make it. A nuclear power plant is working normally. What would you do if the reactor core suddenly got too hot? If the reactor core suddenly gets very hot, then we should insert the control rods of boron a little further into the reactor to reduce the rate of the nuclear fission reaction. A nuclear reactor has half the length of all its control rods inserted in graphite. What must be done so that the reactor produces more heat? Explain your answer. The control rods should be withdrawn a little more from the inside of the nuclear reactor to increase the rate of the nuclear fission reaction and produce more heat. Explain why, in a nuclear reactor, the chain reaction stops if the control rods are fully inserted into the graphite. If the control rods are fully inserted into the graphite, they absorb all the neutrons and therefore the nuclear chain reaction stops. The burning of fossil fuels produces acidic gases and large amounts of carbon dioxide and smoke, all of which pollute the environment. The world's known coal reserves are expected to last for about 200 years. The known reserves of petroleum are expected to last for about 40 years. A compact fluorescent lamp (CFL) is an energy-efficient device. It consumes much less electrical energy than other devices that provide light. Which of the two is a cleaner fuel: hydrogen of CNG? Why? Hydrogen is a cleaner fuel than CNG. This is because the burning of hydrogen produces only water, which is harmless. However, the burning of CNG gives water and carbon dioxide, a gas that can produce the greenhouse effect in the atmosphere, harming the environment. Which of the two is more energy efficient: filament type electric bulb or CFL? Why? A compact fluorescent lamp (CFL) is more energy efficient, because it consumes much less electrical energy than a filament-type electric bulb. How long are the energy resources of the earth like coal, petroleum and natural gas expected to last? The amounts of coal, petroleum and natural gas left in the earth are limited. It has been estimated that the world's coal reserves may last for another 200 years, the known reserves of petroleum for around 40 years and the known reserves of natural gas for around 60 years. Name two devices which can be utilised for the cooking of food so as to save fuel. Two devices that can be utilised for cooking food so as to save fuel are the following. What are the various factors which we should keep in mind while choosing a source of energy? The following are the various factors that we should keep in mind while choosing a source of energy. 1. The ease of extracting energy from the source. 2. The cost of extracting energy from the source. 3. The efficiency of technology used in the extraction. 4. The effect of the energy source on the environment. Can any source of energy be pollution free? Explain your answer with an example. No source of energy can be pollution free. For example, solar cells, solar cookers and wind generators used for generating energy are pollution free, but the processes involved in making the materials to build these devices damage the environment in some way. What are the environmental consequences of the increasing demand for energy? The following are the environmental consequences of the increasing demand for energy. 1. More nuclear power plants are being set up, increasing the radioactivity in the environment. 2. The ecological balance is being disturbed by the construction of hydropower plants. 3. The amount of the greenhouse gas carbon dioxide in the atmosphere is increasing because of the burning of fossil fuels. 4. The combustion of fossil fuels is producing acid rain and damaging plants, soil and aquatic life. What steps would you suggest to reduce energy consumption? The following are a few steps to reduce energy consumption. 1. Switch off electrical devices such as TV, lights and fans when they are not needed. 2. Use energy-efficient electrical appliances. 3. Use pressure cookers and solar cookers for cooking food. 4. Use solar water heaters. 5. Encourage the use of biogas as a fuel in rural areas.